This Focus features good economy ratings, and when combined with fantastic price, this Focus is One of the most frugal commuter vehicles available. This Focus has such Low mileage you'll probably think of them more as blocks traveled than miles traveled. It has been through meticulous inspection and could almost pass for a brand New vehicle. This vehicle was engineered to be both economically and environmentally friendly with exceptional fuel efficiency. 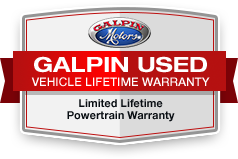 Call us today to see this well-kept Focus in person and experience 'Galpin Used Car Difference'.